Visual system is composed of a variety of visual neurons, each of them sensitive to specific aspects of stimulation. The number of neurons is limited and visual system has to manage this resource by weighing each neuron's measurement depending on the task at hand. The evidence for this comes from measurements of behavioral sensitivity functions. We asked what controls this allocation. We show that stochastic fluctuations of individual receptive field size correlate with uncertainty of neurons's measurement and that such fluctuations lead to minimization of the measurement uncertainty in the system. We applied this principle in a simulation of visual system and obtained a sensitivity characteristic which is strikingly similar to the one measured in humans. Visual contrast sensitivity in a space-time graph. Human spatio-temporal contrast sensitivity (Kelly function) transformed from the frequency domain to space-time (Kelly, 1979; Nakayama, 1985; Gepshtein et al., 2007). The axes are the temporal and spatial extents of receptive fields. The colored contours (isosensitivity contours) represent contrast sensitivity. The oblique lines represent speeds (constant-speed lines). The lines are parallel to one another in logarithmic coordinates. We wanted to see how the hypothesis that visual system "weighs each neuron's contribution" affects the collective sensitivity of the visual system. We created a model, a simple neural circuit, of which the response is controlled by weighing measurements performed by several input neurons. This weighing is modeled by synaptic weights between the input and readout layer of the circuit. We characterized each input neuron by its receptive field size. Then, the size together with its cell's input-readout weight determines the measured receptive field of the whole circuit. As the inputs compete we found out that synaptic weights fluctuate and this fluctuation manifests in stochastic changes in the circuits receptive field size. Mechanism and dynamics of receptive field size. This is a screenshot from an interactive demonstration in a MATLAB(R) script (download circuit_demo.m"). The colors represent three different tasks, black bars and dots illustrate receptive field size and weights for stimulus localization, red for identification and green for joint localization and identification. where p(X) is the likelihood of size X. This outcome is consistent with minimization of the the receptive field size and the uncertainty of measurement. Stochastic tuning of receptive fields in a small vicinity of their parameter space. Coordinates in both panels represent the temporal and spatial extents of receptive fields relative to the center of the region of interest marked by the white cross. 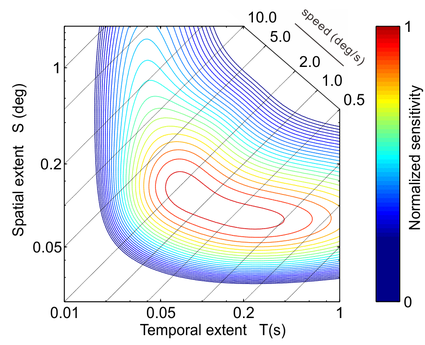 The figure illustrates stochastic tuning for single receptive fields in a small vicinity of the space of receptive field parameters: their temporal (T) and spatial (S) extents. The movie shows 700 stochastic updates of 1,000 independent cells. Left panel: The individual receptive fields are represented by red dots. Initially all the receptive fields have the same parameters indicated by the white cross. The large yellow circumference contains the region of permitted fluctuations. The contour plot in the background represents the measurement uncertainty function the minimum of which is marked by the gray asterisk on top right. Right panel: Normalized histogram of red points in the left panel. Stochastic tuning of receptive fields across their entire parameter space. The figure shows how independent stochastic updates of tuning in multiple cells add up to a distribution of tuning consistent with the distribution of sensitivity in human vision (Kelly, 1979) and with prescriptions of a normative theory of neural resource allocation (Gepshtein, et al. 2007). Left panel: Receptive fields of individual cells are represented by red dots. Here there are 5,000 independent cells across the entire range of plausible spatial and temporal extents of receptive fields. Right panel: The spatio-temporal contrast sensitivity function calculated from the distribution of receptive fields in the left panel. The oblique lines are "constant-speed lines", parallel to one another in the logarithmic coordinates. Jurica, P., Gepstein, S., Tyukin, I., van Leeuwen, C., 2013 - Sensory Optimization by Stochastic Tuning. Psychological Review, in press. Jurica, P., Gepshtein, S., Tyukin, I., Prokhorov, D. & van Leeuwen, C., 2007 - Unsupervised adaptive optimization of motion-sensitive systems guided by measurement uncertainty. 2007 International Conference on Intelligent Sensors, Sensor Networks and Information Processing, 179--184.